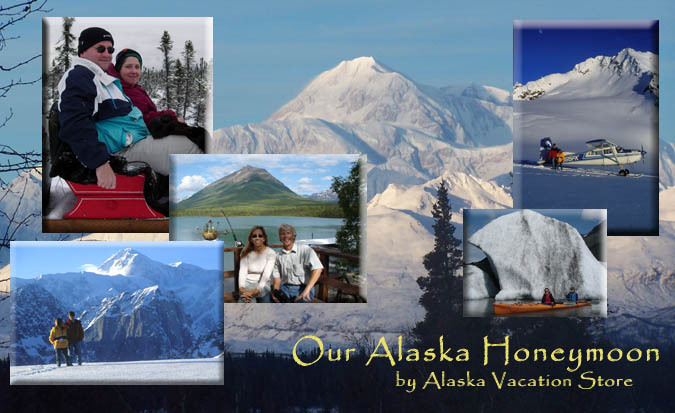 "Our Alaska Honeymoon" by Alaska Vacation Store creates spectacular custom honeymoon and romantic getaway packages. Alaska Vacation Store is a premier custom tour and vacation planning company, located in Anchorage, Alaska. We specialize in custom packages for couples and small groups who want to come to Alaska, but avoid the highly commercialized, crowded and 'touristy' destinations and activities. We get many requests for custom honeymoon and romantic getaway packages, and so we've created this website (in conjunction with our main site) as a resource for the couple planning a honeymoon to Alaska. If you have already started shopping on the Internet for your honeymoon, you've noticed that there are many companies that create packages for guests, as well as hundreds, if not thousands of individual vendors all across Alaska, and the choices can be overwhelming. We create packages for guests traveling almost everywhere in Alaska, but we limit ourselves to only the best vendors, offering the highest quality services, lodging and activities in Alaska. This allows us to create a seamless experience, where all of the lodging, activities and transportation work in concert to create a single, amazing experience for your honeymoon. This sometimes means that we leave out some of the more famous activities, but famous does not always mean better, and we do this to enhance the total experience, offer you the best value and flexibility, and leaving you with lasting memories of a once-in-a-lifetime adventure. Because we start every package from scratch, and tailor the package to your specific interests and needs, your honeymoon will be different than the family vacation that your co-worker took to Alaska. We think this is important because there are so many different options that pre-packaged trips just don't come close to covering all of the possibilities. A honeymoon is a big investment, and you deserve to have it exactly the way the two of you want it. Planning your honeymoon is easy; we take the time to talk to you by telephone and get to know your specific interests and needs. We then create a custom package just for you. About Our Packages... About Our Reputation... Not all Honeymoons... All Seasons are Fantastic! Getting Married... Registry & Gift Certificates Plan your Honeymoon!